Gerry Cheevers is a former goaltender in the National Hockey League and World Hockey Association between 1961 and 1980, most famous for his two stints with the Boston Bruins, where he backstopped the team to Stanley Cup wins in 1970 and 1972. He was inducted into the Hockey Hall of Fame in 1985. 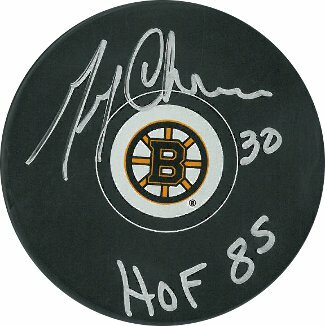 Gerry Cheevers has hand signed this Boston Bruins Hockey Puck with HOF 85 inscription. MAB Hologram and Certificate of Authenticity from Athlon Sports.